I'm writing about my Mohawk ancestor Ots-Toch as part of Amy Crow's Challenge: 52 Ancestors in 52 Weeks . Ots-Toch was my 9th great-grandmother and I've written about her in my book on the Van Slyke family of New Netherland (New York). After researching her extensively, I was able to obtain my Metis status in Ontario. Luckily she is written about in contemporary records and thus proving my Native American heritage was possible. In 2009 I submitted DNA kits to different companies for both myself, my brother and my son. Our Native American ancestry was confirmed through DNA which was like icing on the cake. 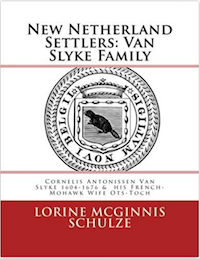 My book The Van Slyke Family in America: A Genealogy of Cornelise Antonissen Van Slyke, 1604-1676 and his Mohawk Wife Ots-Toch, including the story of Jacques Hertel, 1603-1651, Father of Ots-Toch and Interpreter to Samuel de Champlain REVISED EDITION was published May 2010 and is out of print. Caveat: In the theories of Ots-Toch's heritage, please take the use of the word "princess" with a grain of salt. It was common for 19th century writings to romanticize Native American women in particular, assigning daughter of a chief status to them. one that she was a full-blooded Mohawk of the Turtle Clan, the daughter of a Mohawk chief or Sachem. [FN 1] The second theory is that Ots-Toch was the daughter of a French man Jacques Hertel and a full-blooded Mohawk Princess. Ots-Toch was in fact fathered by Jacques Hertel, a French interpretor to Samuel de Champlain. It is not known who her Mohawk mother was. There were many original records pertaining to Ots-Toch. As an example here is one given in my book as found in land records of 1713 for Harmen Van Slyke, grandson of Ots-Toch. "his grandmother was a right Mohawk woman" and "his father born with us at Canajoharie". His father was Jacques Cornelise, son of Ots-Toch, the half French, half Mohawk woman who married Cornelis Antonissen Van Slyke. "in consideration of ye love, good will and affection which we do bear toward our loving cozen and friend Capt. Harmon Van Slyke of Schenectady, aforesaid, whose grandmother was a right Mohawk squaw and his father born with us in the above said Kanajoree [Canajoharie].......it being his the said Harmen Van Slyke's by right of inheritance from his father"
Little is known of the wife of Cornelis Van Slyke although she was written of by the Dutch minister Jasper Dankaerts when he visited Schenectady and spoke with her son Jacques and daughter Hilletie. Her name, Ots-Toch, is clouded in controversy, with some writing it as Alstock. One word in the Mohawk language which may provide a clue to her name is "Otsihsto" meaning "the stars". "Otsihsto" is pronounced so that the sound is similar to "Asistock". It must be remembered that her name was recorded phonetically from verbal accounts and it is possible that Otsihsto is the correct interpretation of Ots-Toch's name. It is important that descendants understand that in my book I have chosen to use the name Ots-Toch as that has come down through history. Included in the book is my chapter discussing the loss of her through time and why I chose to use the name Ots-Toch to represent her. The use of the word "Princess" would imply that Ots-Toch's mother was the daughter of the Sachem or chief of her tribe but I have found NO evidence to support this romantic version of her parentage. According to Nelson Greene and other sources, Ots-Toch was "wild and savage like her mother". Ouida Blanthorn, in her genealogy of Cornelis Van Slyck and his descendants written 1973, states that Ots-Toch was a "half-French, half-Indian maiden of compelling grace and beauty, whose mother was a Mohawk princess [sic] and whose father, Jacques Hartell [sic] was a French trader." Note: Greene and Blanthorn are not contemporary sources and as such must be treated cautiously as primary sources are sought to verify or disprove these statements. Ots-Toch is my great grandmother several times over on both my mother and fathers side. I would love more information on her as she was a hero in the Revolutionary war, caring for the starving Mohaks incarcerated in Pleasant Valley concentration camp. I'm afraid that is impossible. The Mohawk wife of Cornelis Van Slyke was married to him ca 1640-1644. Ots-Toch was long dead by the time of the Revolutionary War. Which DNA kit did you do for your research? I used 2 companies. One showed the native DNA, one did not but another algorithm did show the native DNA. Hi Lorine ! This is kind of un-related to your topic right now, but I need help to discover my Native American heritage ! My interest is not for any legal or monetary purpose . I would just like to know where I came from . I know the heritage has to be on the mother's side , but my heritage is on my father's . His mother was on a reservation until she was 16 years old , but I can't find any record of it ! All I know is that I was told that my Grandmother was part of the Mohawk Tribe /Iroquois Nation. According to what I found on Ancestry.com , her mother was born in Brookfield, MA ! I live in Winchendon, MA. Please if you could possibly point me in the right direction , I would greatly appreciate it ! Thank you for your time ! 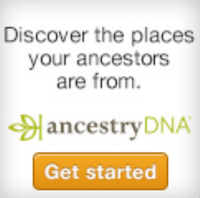 Anonymous - You discover any heritage (Native American or not )by following standard genealogical research procedures. Start with yourself and work backwards, one step at a time. Gather birth/marriage and death records. Please see Help for Beginners for more help. I submitted my documentation to the Metis Nation - fully sourced of course - and my application was accepted. Many of us descended from Ots-Toch have been accepted. Yes, my cousin got his status through MNO and I'm working on finding time to resubmit my application. He's a cousin through Ots-Toch. Hi - no need to apologize and please DON'T delete your comments! My cousin used my book for details and sources and then I sent him more as he needed it. Ots toch was the only line he used as that is the only one he has. Hi, I was able to trace my ancestry back to ots- toch. My surname is coppernoll. Which would make Leah (van Slyke) coppernoll a great grandmother several times over. Anyways my name is Theresa (coppernoll) willmott. I was wondering first if there are any Mohawk tribes left in new York state? And also secondly if there are how to go about being acknowledged as part of that tribe? Who on earth did Kenutjie Hertel marry? The account I read says she married a Bradt. She was Ots-Toch's sister. What children were born to this union? Was it Arent Bradt? Was she his second wife? Are there two Arent Bradts that confuse this? Please help me figure this out. There is no proof of this family lore that there was a Kenutje who married a Bradt. I looked for some evidence either pro or con when I researched for my book on Cornelis Van Slyke and Ots-Toch, but found no records. There are many Arent Bradts but the one this lore refers to is Albert Andriessen's brother Arent Andriessen who married circa 1648 to Catalyntje de Vos.